Good afternoon everyone! I have another project to share with you! This card was created for the SCCSC120 sketch challenge on Stampin' Connection. You also get a little bit of a sneak peak at some of the new goodies from the new catalog that you will get to see on June 1st! I started off with a piece of Whisper White card stock cut at 5-1/2" x 8-1/2" and scored at 4-1/4". Then I cut a piece of Gumball Green card stock 4" x 5-1/4". I stamped the leaves image from Papaya Collage in Gumball Green ink several times on the left side of the card stock. 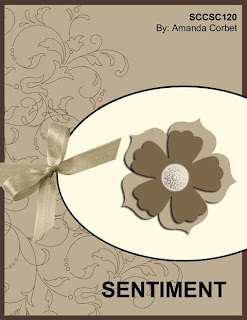 Then I wrapped a piece of Whisper White Stitched Grosgrain ribbon around the card stock and tied it into a bow. Next I cut a piece of Whisper White card stock 4-1/2" x 5-1/2" and ran it through the Big Shot on the Clear Oval Accents die. I used a Stampin' Sponge with Summer Starfruit ink to sponge around the edges of the beautiful oval. I stamped the greeting from Friendly Phrases in Midnight Muse ink on the left side of the oval. Then I adhered the oval onto the Gumball Green layer and used Paper Snips to trim the oval even with the edge of the Gumball Green card stock. I adhered this panel onto the card front. Now for the beautiful butterfly. I used the detailed flower image from Mixed Bunch and inked up the stamp first with Summer Starfruit. 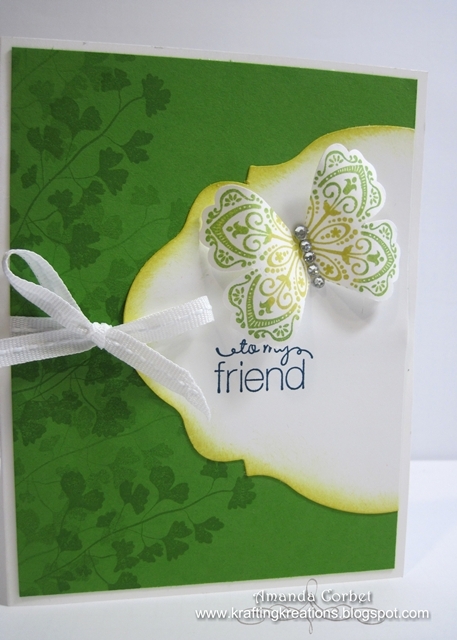 Then I used the Rock-N-Roll technique with some Gumball Green ink before stamping the flower onto a scrap piece of Whisper White card stock. I punched out the flower with the Blossom punch then used Paper Snips to cut out two of the petals to make it look like a butterfly. I adhered the butterfly onto the card front with a Mini Glue Dot and then added some Rhinestones to create the butterfly's body and add a bit of sparkle. 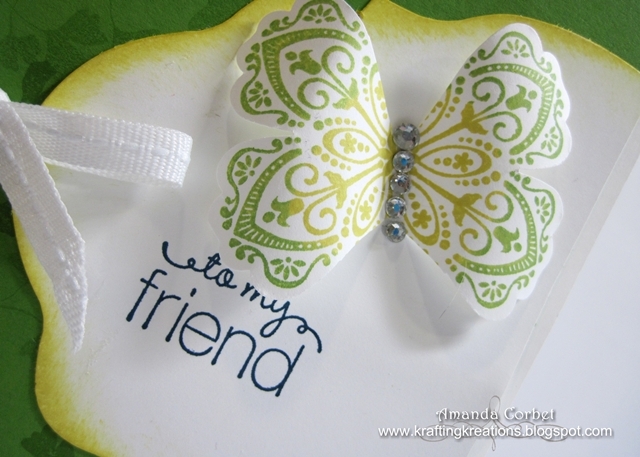 I really love how this card, and the butterfly, turned out! What do you think?